"I've never really succumbed to peer pressure,” Gervais tells Matt Lauer. Ricky Gervais isn't worried about taboos as Golden Globes host. Ricky Gervais said he’ll be under no restrictions from higher-ups when he returns to host the Golden Globes later this month. One year after he ruffled feathers in Hollywood with biting one-liners at celebrities, Gervais told NBC’s Matt Lauer that no topic would be off limits at the Jan. 15 awards show. Gervais, who's taking his third crack as host, said he signed up for the gig the first time because he’d “thought it’d be fun.” But he conceded that he “got it a bit wrong” the first time around, MSNBC’s Courtney Hazlett reported. “I tried too hard with the shtick, the comedy, and I should have just gone out there and done zingers, I think, because the attention span of someone at an award show, particularly the Golden Globe, is about a second," Gervais said. "They're drinkin', they're talkin', they're seein' someone. You know, you've gotta grab their attention ... They're there to see if they've won an award, but they don't wanna see this guy come out and telling jokes. Certainly not jokes at their expense." The HPFA acknowledged the controversy in announcing it had re-hired Gervais for 2012. "While many welcome Gervais's return, not everyone is happy with the decision because last year his blunt one-liners targeting big-name celebrities caused anger and resentment in some quarters," the organization said on its website. It’s hard to know what Gervais has in store for this year's Globes. He told Lauer he considers himself “bulletproof” from criticism. “What do I care if someone likes what I do or not? 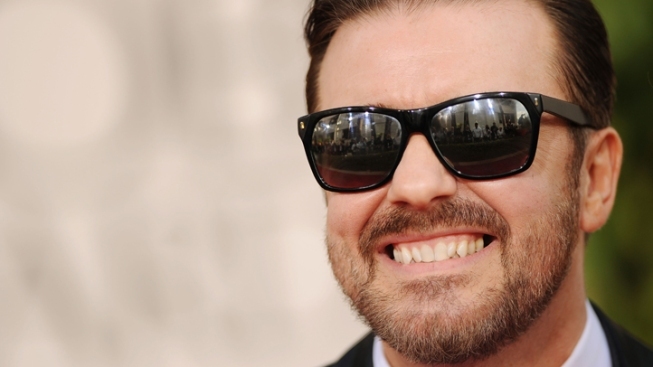 I just don't anymore,” Gervais said. “If you get your own way, if you get final edit and you enjoy what you're doing and things turn out exactly as you wanted 'em, what -- what else is there?" Tune in NBC’s “Today” on Friday or “Dateline” on Sunday to see Gervais’ full interview.